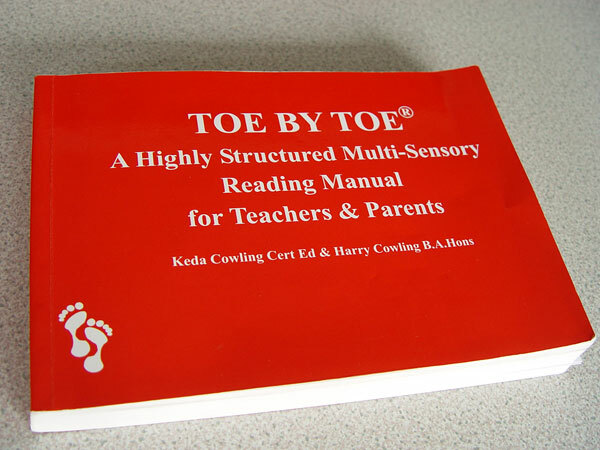 Toe By Toe is a small red book designed for anyone who finds reading difficult. This includes weak readers who struggle to decode or those with dyslexic difficulties. Keda Cowling chose the name 'Toe By Toe' to signify that students make progress by the tiniest steps – one toe at a time. However, even though the steps taken are small, students can clearly measure progress right from the first page. Confidence and self-esteem are boosted as a result. Over 25 years of fieldwork went into the development of the system and it is this research that makes the method so easy to use. You don’t have to be trained in any field of education to coach with Toe By Toe. In fact, the manual often works better with non-professionals as they do not come to the task with any pre-conceived notions and thus simply follow the very detailed instructions to the letter. The unique syllable division employed by Toe By Toe is very easy to use. Once the sound of a phoneme has been taught using the ‘polynons’ (nonsense words), these rules can then be applied to any multi-syllabic word and students find a whole new world of reading opening before their eyes. Regardless of the nature of students’ literacy problems, they can be taught to read using Toe By Toe. The severity of their problems may only be reflected in the length of time needed to get through the book. The rapid improvement in reading age is truly astonishing.